Heat oil in skillet and saute sausage over med heat until brown. 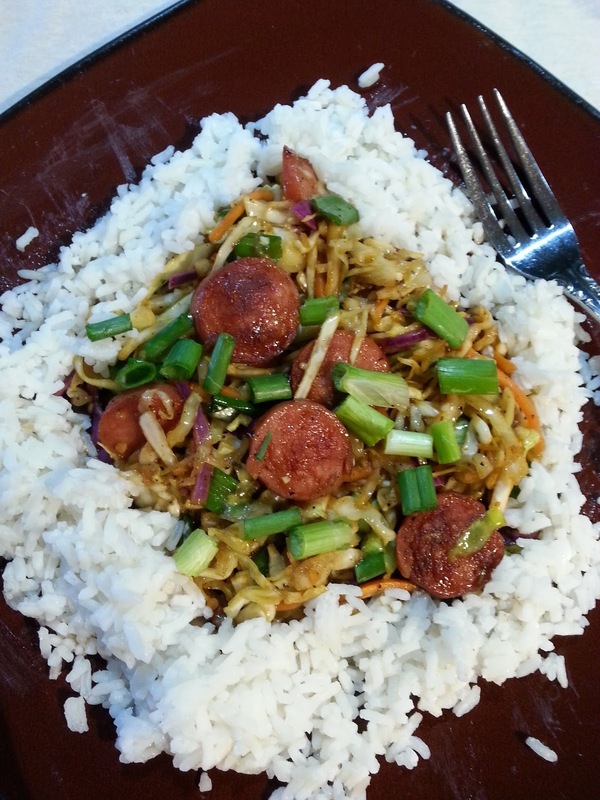 Stir in coleslaw and remaining ingredients except green onions and rice, cook 10 minutes, stirring often. Stir in green onions and cook additional 5 minutes. Serve atop bed of rice. Love this recipe! 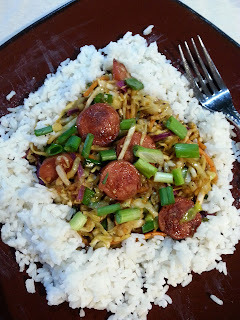 Garlic sausage and cabbage are two of my favorite things! I just love all of the flavors and textures in this dish! Looks great Christine! Super easy meal! Right! Easy and budget friendly meal. This sounds like a great dinner! And I need one now! This is one tasty meal! Can't wait to make it! Looks amazing and i love the idea of using the coleslaw mix as a shortcut!